You and your roommates are getting ready for pregaming, there is not a cloud in the sky and the Owls kickoff at 7:30 pm. Tailgate season is upon us and I’m here to bring you up to date with the latest fashion attire trends. Although it looks like you’re in a Bring It On sequel, Cheerleading skirts are one of the popular bottoms that girls pair with a customized college tube top. Did I mention that they’re affordable too? While a cheerleading skirt is not something that I would necessarily wear, many of my friends are able to make a super cute outfit using one! White high-top converse or Vans can also be paired with this look to add some comfort, especially when you are walking from tent to tent to tailgate with all of your friends. If sneakers are not your style, pick out some trendy sandals. Girls also like to wear a bralette with their outfits. If you don’t feel like wearing a bralette, I’ve seen many girls just wear a red or navy sports bra and a shirt where you can see the color of the bra underneath. 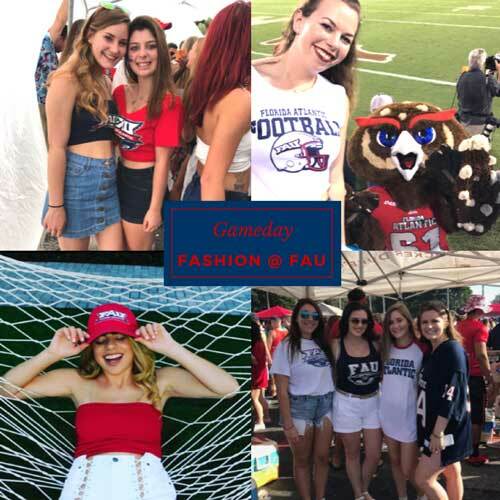 While there are many “cute” designs and Owl logo cropped shirts, it is very easy to create your own look and style using your basic FAU attire. When it comes to tops, the options are endless. Any bottom goes with a crop top, halter top, bandeau, or DIY shirt. Personally, I have never been skilled in cutting or distressing t-shirts so I have either bought them from Etsy or have had my roommate style it for me. There are also YouTube tutorials and resources online if you are into doing it yourself. Many of the girls will wear college chokers. This is another good accessory to spice up your game day outfit, the little things can provide just the “pop” that you are looking for. 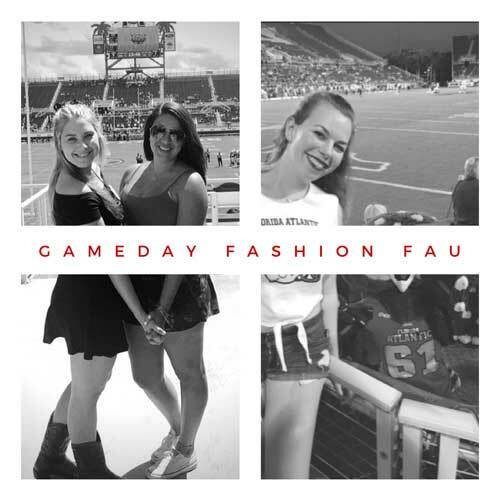 A lot of students find trendy cheerleading skirts, bandeaus and accessories in the FAU colors at an online store called Hype and Vice and GameBaes. Both guys and girls can also be seen wearing blue and red striped overalls. I personally love the overalls because not only do they look cool, it is a funny and goofy look for a day of cheering on our favorite team. Locally, the girls will get their FAU outfits from the Boca stores including the FAU bookstore and It’s Owl Time. Located on 20th street right down the road from campus, It’s Owl Time has a great selection of shirts, shorts, hats, and accessories to buy for gameday! If you are a student, you also get at least a 10% discount off of your purchase! In addition to It’s Owl Time, you can never go wrong visiting the bookstore on campus for some apparel. I have bought many shirts there that I was able to cut and turn into an awesome gameday shirt! For the guys, they mostly wear dry-fit collared shirts and tanks. A lot of guys choose the simple route and get their apparel at the bookstore or It’s Owl Time, but for more options like t-shirts, sweatshirts, sweatpants – really just about anything that screams their college logo, check Fansedge and Fanatics. Have U Heard that the collegiate stadiums have a Clear Bag Policy for football games? When game-day gets here, you need to make sure you have everything you need. This one-of-a-kind Clear Game Day crossbody purse is the perfect choice to carry all of your essentials in a way that also highlights your intense fervor. Use HUH15 and then you will receive 15% off and look like the most devoted FAU Owls fan when you’re carrying this. Confidence is key. If you like what you put on and are looking good, it changes how you carry yourself and also the way you interact with others. Sure, I gave you a lot of trendy and cute suggestions for every tailgate and college game day of the season, but it is important to pick something that you’re comfortable in. Remember we may lose a game, but you have never lost a tailgate. Finally, don’t forget your Owl face tattoos. You can get those at Its Owl Time. It’s also a good idea to buy a few shirts with your friends and split them so you can all share because most people only wear certain things at one time.